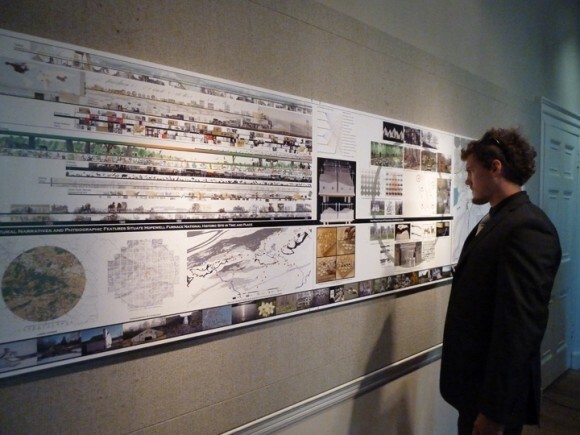 Share the post "Landscape Architecture Students Win National Award Re-Imagining America’s National Parks"
LA student Daniel Rounds viewing Rutgers design at American Association of Architects headquarters in Washington, D.C.
A team of graduate and undergraduate students in the Department of Landscape Architecture at Rutgers earned top honors in a national student design competition sponsored by the Van Alen Institute and the U.S. National Park Service. “The objective was to create a ‘Park for the People’ that promotes reverence for place and advances social, economic and ecological sustainability through an integrated research, planning, design and review process,” said Kate John-Alder, assistant professor in the Department of Landscape Architecture and project leader in the competition. For its design of the Hopewell Furnace National Historic Site, the students won an Award of Excellence, making Rutgers one of two semi-finalist schools to receive top honors in the competition titled “Parks for the People: A Student Competition to Re-imagine America’s National Parks.” The award ceremony took place at the headquarters of the American Association of Architects in Washington, DC, on Sept. 19. Graduate students included James Bykowski, Kimberly Corbo Nuccio, Wanqing Huang, Mukta Jadhav, and Denisse Ortiz. Undergraduate students included seniors Ibrahim Bouzine, Roxanna Demel, Lissa Dieye, and Meghna Mirali and juniors Derrek Cowell, Joshua Didriksen, Ben Granovsky, Daniel Rounds and Francis Turner. There were two Teaching Assistants in the Praxis Studio: Andrew Opt’ Hof and David Hanrahan. Faculty advisers brought significant expertise to the competition, said John-Alder. Faculty included Lena Struwe, associate professor, and Brooke Maslo, research specialist, from the Department of Ecology, Evolution and Natural Resources; David Tulloch, associate professor in the Department of Landscape Architecture; and Katharine Woodhouse-Beyer, archaeologist with the Department of Anthropology, School of Arts and Sciences at Rutgers. The Rutgers team was joined by animation specialist Laura Sasso and a web design firm. Read more on the winning Rutgers design and the national competition.